Rapid technological advances have proliferated in today’s world in each and every sector. The Internet of Things (IoT) is one such revolutionary technology which has touched a variety of sectors including e-commerce retail sector and millions of lives through its astounding simplicity and efficiency. The Internet of Things is basically an enmeshed network of physical objects which are embedded with sensors, actuators, and software, which enables these objects to collect and exchange data in the real time. While many areas of impact are still to emerge in the near future, one of the major areas where the Internet of Things is having a definite influence is the retail and e-commerce sector. This technology is radically changing the way a shopper shops! It has transformed the traditional shopping approach into a more streamlined, methodical and user-friendly experience. The explosion of connected devices combined with enriched, less-expensive technology platforms and adoption of common standards will only intensify the growth of IoT-enabled capabilities across the retail industry. Retail and E-commerce businesses will accrue a number of benefits by adopting this revolutionary technology, which is now helping traditional businesses grow leaps and bounds in a short span of time. Let’s now glance over some of the major advantages that IoT technological advancements are providing the modern E-commerce and retail sectors. Internet of Things technology is enabling retailers to provide a more holistic shopping experience to customers, which is leading to high levels of customer engagement. Personalized and contextualized interactions with customers provide solutions to their anticipated needs and strengthen customer relationship management from the retailer’s end. Retailers can also sell targeted merchandise based on previous shopping and buying patterns revealed through loyalty programs, online browsing, and search trends. 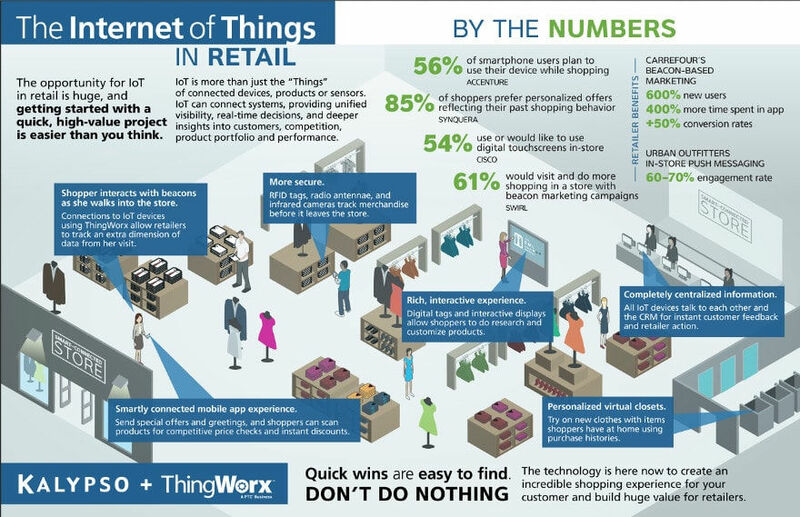 A number of radical IoT related technology platforms are helping retailers capitalize and focus on the needs of the customers. Bluetooth low energy beacons, when paired with retailer’s shopping applications on customer’s smartphones, help to decipher how shoppers move around the store. Instead of common mass messages, a smart retail environment will ensure shoppers get deeper information about what they are looking for, solve individual queries and positively influence buying decisions. Internet of Things is a technology which utilizes vast amounts of real-time information to provide value to customers. In fact in today’s competitive retail market scenario, the amount of aggregate customer data a retailer has is a leading indicator of its brand equity in the market. Retail stores are using this valuable data to indulge in a number of customer engagement tactics which include a provision for timely after-sales service, maintenance, and long-term warranties. IoT technological advances also help retail businesses differentiate themselves in the eyes of the customer by providing them with unique selling propositions. For example, retail giant Walmart uses IoT technology to mine social media data to find out what types of products are increasing in popularity. Disney Parks have also jumped on the IoT bandwagon by providing customers with RFID-enabled Magic Band wristbands. These wristbands have multiple functions and allow customers access to Disney theme parks and hotels, card-free payment of merchandise and other special privileges. Hence, we see that IoT technologies today are helping retail businesses innovate on their product offerings and dramatically enhance the value provided to customers. Seamless and uninterrupted supply chain management are crucial factors in the success of any retail business. IoT technology plays a huge role in ensuring the continuous and smooth flow of goods from one place to another. The application of technology can help in the constant tracking of goods from their journey of production to consumption. A high-level global positioning system (GPS) and radio frequency identification (RFID) techniques help to identify a product which is in transit and provide exact data about its location, temperature etc. A customer can be provided accurate delivery information after a retailer tracks the traffic conditions, road blocks and average speed of transporter. IoT technology helps e-commerce merchants optimize their inventory and prevents over-stocking or shortage of products in warehouses. Smart systems provide valuable information to e—commerce retailers such as what’s under-performing and overstocked, what products are running out of stock, environmental conditions, online trending and countless other potential variables that impact sales output. The Internet of Things is slowly establishing an important identity for itself in modern businesses, which are now dependent on this technology for a multitude of reasons. It is helping retailers to increase revenue by managing inventory, tracking thefts and loss, enhancing shopper intelligence and enabling mobile payments. The ubiquitous nature of the World Wide Web and decreasing cost of components such as sensors, microchips and actuators are providing further thrust to IoT technology. We can surely expect the retail sector to flourish in the coming years owing to the increasing usage of mobile applications and penetration of IoT in all functions of e-commerce operations. IArpit Sharma is a content analyst at SoftwareSuggest.com. As a person, he is free spirited and happy. In his free time, he likes travelling and reading books. You can follow the SoftwareSuggest company page on LinkedIn here. Hi, Arpit. I fully agree with your opinion on e-commerce revolution which has shown tremendous growth and is expected to grow even more. Also, the RFID technology you mentioned, as well as the GPS, definitely would aid in security. These features aid consumers as well. Your final point that the retail sector will continue to flourish because of these technologies is a valid one. (GPS) and radio frequency identification (RFID) were interesting details within this process. This technology is rapidly changing the way to a shopper shops! It has transformed the traditional shopping approach to more streamline, methodical and user-friendly experience. I’m amazed by all the information I get on your article. Very precise well written. All are on point. Will read more article from your blog from now on. Cheers!! The e-commerce business is expanding very rapidly with the growth of Internet to numerous users. Very well written post. The e-commerce industry is at its peak right now. Internet thing is really working well as it checks theft which was not possible otherwise as we can see inventory online. If somewhere it falls short we can immediately have a through check for it. Thanks for sharing this content with us.Hope it will be helpful for my ecommerce site.